For the week, the Dow (up 7.3% y-t-d) and the S&P500 (up 4.3%) each rallied 2.3%. The Tranports gained 3.1% (up 7.8%), and the Morgan Stanley Cyclical index jumped 4.3% (up 15.5%). The Morgan Stanley Consumer index rose 1.7% (up 3.4%), and the Utilities gained 2.2% (up 7.1%). The small cap Russell 2000 increased 1.6% (up 1.4%), and the S&P400 Mid-cap index jumped 3.1% (up 7.5%). The NASDAQ100 surged 3.8% (up 11.6%), and the Morgan Stanley High Tech index gained 3.1% (up 10.8%). The Semiconductors added 1.4% (up 5.8%). The Street.com Internet Index rose 2.7% (up 10.8%), and the NASDAQ Telecommunications jumped 3.9% (up 14.1%). The Biotechs rallied 2.1% (up 2.7%). The Broker/Dealers gained 2.3% (down 6.1%), while the Banks declined 1.0% (down 7.2%). Three-month T-bill rates, trading as low as 2.53% during Monday's session, ended the week 38 bps higher at 4.25%. Two-year U.S. government yields rose 10 bps to 4.29%. Five-year yields gained 6 bps to 4.41%. Ten-year Treasury yields went the other way, declining 6 bps to 4.62%. Long-bond yields ended the week down 10 bps to 4.89%. The 2yr/10yr spread ended the week at 33 bps. The implied yield on 3-month December ’07 Eurodollars surged 23 bps to 4.945%. Benchmark Fannie Mae MBS yields declined 10 bps to 6.00%, this week outperforming Treasuries. The spread on Fannie’s 5% 2017 note narrowed 9 to 56, and the spread on Freddie’s 5% 2017 note narrowed 9 to 56. The 10-year dollar swap spread declined 10 to 66. Corporate bond spreads generally narrowed late in the week, although the spread on a junk index ended the week 15 bps wider. Investment grade debt issuers included Comcast $3.0bn, Merrill Lynch $2.75bn, Goldman Sachs $2.5bn, XTO Energy $2.25bn, Bank of America $1.5bn, American Express $1.5bn, MidAmerica Energy $1.0bn, General Mills $700 million, Starbucks $550 million, Con Edison $500 million, Kinder Morgan $500 million, Anheuser Busch $500 million, Union Pacific $500 million, Coventry Health $400 million, Lincoln National $300 million and Georgia Power $250 million. Junk issuers included Sabic $1.5bn. International dollar bond issuance this week included Deutsche Bank $3.0bn. German 10-year bund yields dipped 2 bps to 4.26%, while the DAX equities index rallied 1.7% (up 13.8% y-t-d). Japanese 10-year “JGB” yields added one basis point to 1.59%. The Nikkei 225 recovered 6.4% (down 5.7% y-t-d). Emerging debt, equity and currencies markets generally enjoyed strong rallies. Brazil’s benchmark dollar bond yields sank 31 bps this week to 6.01%. Brazil’s Bovespa equities index surged 9.1% (up 19.2% y-t-d). The Mexican Bolsa rallied 5.4% (up 13.6% y-t-d). Mexico’s 10-year $ yields fell 19 bps to 5.73%. Russia’s RTS equities index added 0.2% (down 3.0% y-t-d). India’s Sensex equities index gained 2.0% (up 4.6% y-t-d). China’s Shanghai Composite index gained five straight session, ending the week up a bubbly 9.7% (up 91% y-t-d and 215% over the past year). Freddie Mac posted 30-year fixed mortgage rates dropped 10 bps this past week to 6.52% (down 4bps y-o-y). Fifteen-year fixed rates fell 12 bps to 6.18% (unchanged y-o-y). One-year adjustable rates declined 7 bps to 5.60% (also unchanged y-o-y). Bank Credit surged $38.1bn (week of 8/15) to $8.734 TN (7-wk gain of $168bn). For the week, Securities Credit increased $10.8bn. Loans & Leases jumped $27.3bn to $6.410 TN (3-wk gain of $81bn). C&I loans rose $11.2bn, while Real Estate loans declined $12.9bn. Consumer loans dipped $0.5bn. Securities loans declined $2.3bn, while Other loans surged $31.8bn. On the liability side, (previous M3) Large Time Deposits increased $11.1bn. M2 (narrow) “money” increased $6.5bn to $7.289 TN (week of 8/13). Narrow “money” has expanded $245bn y-t-d, or 5.5% annualized, and $442bn, or 6.5%, over the past year. For the week, Currency declined $1.1bn, and Demand & Checkable Deposits fell $18.1bn. Savings Deposits jumped $17bn, while Small Denominated Deposits dipped $0.5bn. Retail Money Fund assets jumped $9.1bn. Total Money Market Fund Assets (from Invest. Co Inst) surged another $76bn last week (5-wk gain of $204bn) to a record $2.777 TN. Money Fund Assets have increased $395bn y-t-d, a 25.4% rate, and $564bn over 52 weeks, or 25.5%. 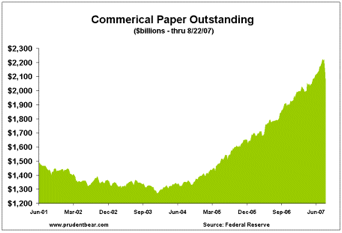 Total Commercial Paper dropped $90.2bn last week to $2.042 TN, now with a y-t-d gain of $67.9bn (5.3% annualized). 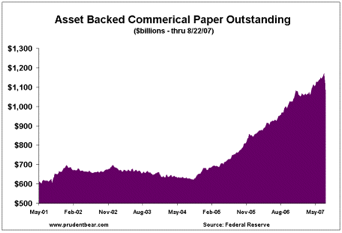 Asset-backed commercial paper has declined $120.9bn during the past two weeks to $1.053 TN (up $96.6bn y-o-y). CP has increased $206bn, or 11.2%, over the past 52 weeks. Asset-backed Securities (ABS) issuance increased somewhat to a still light $5.0bn. Year-to-date total US ABS issuance of $497bn (tallied by JPMorgan) is now running about 20% behind comparable 2006. At $207bn, Home Equity ABS sales have ground to a halt and are now 45% below last year’s pace. CDO issuance has slowed sharply, with y-t-d US issuance of $232bn running only 9% ahead of record 2006 sales. Fed Foreign Holdings of Treasury, Agency Debt last week (ended 8/22) dropped $18.4bn to $1.986 TN. “Custody holdings” were up $234bn y-t-d (20.5% annualized) and $316bn during the past year, or 18.9%. Federal Reserve Credit last week declined $16.1bn to $851.7bn. Fed Credit is little changed y-t-d, with one-year growth of $26.7bn (3.2%). International reserve assets (excluding gold) - as accumulated by Bloomberg’s Alex Tanzi – were up $875bn y-t-d (27.8% annualized) and $1.108 TN y-o-y (24.2%) to a record $5.686 TN. The spot dollar index dropped 0.9% this week to 80.67. On the upside, the Brazilian real gained 4.9%, the South African rand 3.3%, the New Zealand dollar 3.0%, the Australian dollar 2.5%, and the Norwegian krone 1.8%. On the downside, the Japanese yen declined 1.3%. The Euro gained 1.4% and the Swiss franc 0.4%. For the week, Gold recovered 1.7% to $668.38, and Silver rallied 2.5% to $12.10. Copper surged 7.7%. September crude managed to gain 51 cents to $71.98. September gasoline declined 2.8%, and September Natural Gas sank 22%. For the week, the CRB index dipped 0.2% (down 0.5% y-t-d) and the Goldman Sachs Commodities Index (GSCI) lost 0.8% (up 11.8% y-t-d). August 22 – Bloomberg (Bill Faries and Matthew Craze): “Argentina’s jobless rate fell to its lowest level in almost 15 years in the second quarter… The unemployment rate declined to 8.5% in the second quarter from 10.4% in the same period a year earlier…"
August 24 – Financial Times (Anuj Gangahar): “Turmoil in financial markets has inflicted significant damage on the investment performance of some of the biggest names in the hedge fund sector, with data showing DE Shaw and Goldman Sachs continuing to suffer losses. DE Shaw, a pioneer of quantitative investing based on complex mathematical and computer techniques, has been hit hard. Its Valence fund is down more than 22% cent in August, according to fund of hedge fund managers. These investors estimate that DE Shaw Composite, a multi-strategy fund, is down 7% for the month… The flagship Goldman Sachs Alpha fund was down 16% so far this month, investors said. According to Hedge Fund Research of Chicago, every fund strategy is in negative territory over August so far. Prominent vehicles that have suffered include those run by Barclays Global Investors and GLG. BGI’s 32 Capital Fund was down 7% for the month to Monday last week. GLG's European long-short fund, one of the company’s biggest with more than $2bn in assets, fell 4.4% in the first 10 days of August. Some still refer inaptly to the “subprime crisis”. It should by now be evident that subprime was merely the point of initial risk market dislocation, in a crisis of debt contagion that has now engulfed The Epicenter of the Credit System – The Money Market. Global central bank interventions to the tune of $400bn or so have been instrumental in controlling what otherwise would have been a devastating “seizing up” of global financial markets. And it certainly didn’t hurt that chairman Bernanke was quoted this week as saying he “intends to use all available tools.” The markets delighted in the timely reminder of two of Dr. Bernanke’s most famous speeches - his October 2002, Asset-Price "Bubbles" and Monetary Policy, and his November 2002, Deflation: Making sure “it” doesn’t happen here. With the past couple days of strong stock market gains and the perception that abundant liquidity has returned, scant attention will be paid to Bill Gross commenting yesterday that the asset-backed commercial paper market was likely “history.” Wow! At the time, I thought to myself that in more normal market environments such a revelation would have been good for a 500 point drop in the Dow. But stock market complacency remains palpable – faith in the Fed and global central bankers resolute. According to the bullish consensus, economic fundamentals remain sound and, with assurances of ongoing Fed patronage, growth and corporate profits will hardly miss a beat. Before I dive into the Money Market Issue, I am compelled to refute the notion that the Federal Reserve today enjoys great flexibility to lower rates to whatever level whenever necessary to sustain the economy and stock prices. In fact, a strong case can be made for quite the opposite. For one, I believe inflationary risks are greater than generally perceived by the bulls. In stark contrast to the “dis-inflationary” period of the nineties through the initial years of this decade, the global backdrop is inflationary and, perhaps, stubbornly so. Booms in China, India, Russia, Brazil, and elsewhere have respective heads of steam and, importantly, so far domestic Credit systems appear to possess atypical immunity to U.S. Credit tumult. In spite of troubling illiquidity issues in cross-sections of the financial markets, the massive dollar reserves held in overabundance around the world will likely for some time buttress global energy and commodities prices. Note the price of crude, wheat, gold, copper, Chinese stocks and “emerging” markets, in general. I further believe that the vulnerable dollar will prove the proverbial Achilles heel for the upcoming easing cycle. The days of aggressive - and market-pleasing - Greenspan-style rate collapses could prove a luxury of the past. The Bank of China Ltd dropped 5.4% today on the Hong Kong stock exchange after disclosing that it had $9.7bn of U.S. subprime exposure. The European banking system is under considerable stress as it struggles to deal with U.S. Credit woes. The market focus today may be on the apparent success huge interventions by the ECB and Fed are having in restoring liquidity. Yet the critical issues of private sector Risk Intermediation and U.S. Current Account Deficit “recycling” become murkier by the day. Wall Street and Washington have been all too happy to perpetuate the myth that the world simply cannot get its fill of U.S. “investment.” As the fable is told (and repeated), we consumers must gorge on imports to satisfy the requirements of a massive “global savings glut” that foreigners are almost desperate to bestow upon our (miracle) economy. Yet it is now emerging that the international banking community (especially European) has been a major participant in a massive speculative arbitrage in U.S. debt instruments – a financial scheme that is now unraveling. To what extent the dollar owes its resilience over the past few years of massive Current Account Deficits to speculation-based “SIVs”, “conduits”, and “carry trades” is today a legitimate question. Primary dealer repurchase agreements (“repo”), as reported by the NY Fed, have ballooned $630bn over the past year. Money Market Fund assets have a one-year gain of $560bn. Prior to the decline over the past two weeks, Commercial Paper was sporting an unprecedented 12-month gain of $420bn. One-year CDO (collateralized debt obligations) issuance has been in the neighborhood of $600bn. These interrelated markets that comprise a dominant position in today's Money Market – “repo”, “money funds”, CP, and CDOs – were absolutely crucial in sustaining the aged Credit Bubble in the face of mounting financial and economic strain. In reality, they have amounted to the heart and soul of contemporary “Wall Street Finance” as it succumbed to perilous “blow-off” excess. After years of financial innovation begetting soaring remuneration begetting ever greater risk-taking and innovation – Wall Street had fully mastered the “alchemy” on transforming endless risky loans (mortgages to consumer debt to corporate debt to leveraged loans) into securities that could be pooled to create highly-rated yet relatively higher-yielding CDOs (and other derivative instuments). Structured Investment Vehicles (“SIVs”) and various types of “conduits” – equipped with offshore “bankruptcy remote” status and “liquidity agreements” from sponsoring “banks” – used their top (A1/P1) CP ratings to issue cheap short-term commercial paper to the money market funds and various (perceived safe and liquid) “money-like” investment vehicles. This Credit “arb” had been enormously profitable. The securities firms accomplished similar excess returns through various special purpose vehicles, along with the newfound strategy of using CDOs and other risky securities as collateral for “repos.” This powerful Monetary Process was at the heart of the seduction of seemingly insatiable Credit supply AND demand. The subprime implosion and the resulting forced liquidation of various securities and structures set in motion the revelation that top ratings masked what were in many cases significant underlying Credit and liquidity risks. Newfound risk aversion and the resulting reversal of the flow of speculative finance immediately and dramatically altered Credit Availability and Marketplace Liquidity, with the upshot being (“Ponzi Finance”) fragility and rapidly escalating Credit and liquidity risks issues. Suddenly, the marketplace lost trust in the securities, CDOs and structures used by the “SIVs” as collateral for their CP borrowings. There was a “run,” and many “conduits” were unable to roll their commercial paper and other short-term borrowings. It is my best guess that a large chunk of the $400bn or so central bank intervention has been provided in large part to the European banks as liquidity to accommodate the repayment of “conduit” short-term borrowings (largely asset-backed CP). While the scope of the problem is alarming (global banks are estimated to have almost $1 TN of “conduit” liquidity agreement exposure), central banks are well-placed for providing such liquidity directly to the banking community. The markets can rejoice at the willingness of global central bankers to go to such extreme measures to restore liquidity, but at the same time I fear the market is overly complacent with respect to the ramifications and repercussions of the dislocation in this critical marketplace. 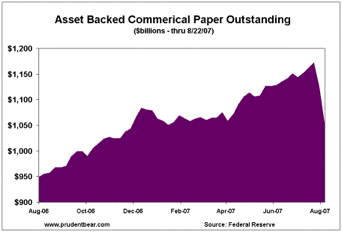 If the asset-backed commercial paper market is indeed “history” then I would expect this development to prove a seminal event for Wall Street “structured finance.” All the SIVs and conduits worked marvelously to camouflage, distort, conceal and, in the end, perilously mis-price risk – and did all of the above in grand, historic excess. They played an instrumental role in late-cycle Risk Intermediation and they played recklessly. The underlying collateral was - despite their “AAA” and “AA” ratings - inappropriately risky and illiquid to be intermediated through the money market. Central banks do maintain the capacity to create the liquidity necessary to accommodate the unwinding of this specific Credit “arb.” I question, however, the viability of this critical Wall Street mechanism for Risk Intermediation going forward. The “money market” has traditionally been at the nerve center of financial crises. Especially late in the cycle, this marketplace will inevitably be the locus of the most enterprising – and often complex - Risk Intermediation Processes. Investors will look to this market for its traditional safety and liquidity, yet late-cycle complacency will tend to foster a level of risk acquiescence and gullibility. At the same time, the borrowing, investment banking, and brokering side of the market cannot resist the bounty available from pushing the envelope. Eventually, the liquidity backdrop is interrupted and the degraded nature of underlying Credit conditions is revealed. And it will often be the case that an abrupt change in perceptions (i.e. what qualifies as "money") and a bout of risk intolerance in the “money market” – where risk-averse investors demand safety and liquidity – will spark a panic and liquidity crisis that quickly engulfs the riskier markets. And when the risk pendulum swings away from risk embracement, Money Market investors will tend to be much less forgiving and longer memoried than risk speculators. But I’ll be the first to admit this is no typical financial crisis. It escalated at breakneck speed, with global equities, commodities, and general asset prices at or near record highs. Additionally, the global economy is in the midst of an unusual boom. Ironically, Acute Fragility in the relatively safe Money Market has so far proved a boon to highly inflated and vulnerable global stock markets. Dislocation and the risk of markets “seizing up” required immediate and extraordinary central bank intervention (agree or disagree, this is the accepted role of central banks), and equity market participants now really assume they are protected. And while an impending financial crash was fortunately circumvented for the time being, Bubbling U.S. and global equities markets cannot for long avoid vulnerability to altered Risk Intermediation Dynamics. And this issue gets back to the flawed view of the Fed’s role in the Great Depression: If only the Fed had created $5bn and recapitalized the banking system. More money, so they believe, would have provided a (“mopping up”) remedy for disastrous boom-time excesses. But it wouldn’t have worked. The issue then, as it is today, is not some finite amount of liquidity to keep the banks solvent and markets liquid, but instead the enormous ongoing Credit Creation and Intermediation required to sustain levitated asset prices, incomes, corporate earnings, government receipts and mal-adjusted economic systems. I personally believe it is at this point likely impossible to maintain these extremely inflated Credit and Economic Bubbles. The Risk Intermediation requirements are untenable, especially if trust in Wall Street finance – and, importantly, in contemporary “money” - is waning. Indeed, I expect the current backdrop to prove an absolute Credit and liquidity glutton. Central bankers will be faced with the dilemma of accommodating an insatiable appetite for liquidity injections or, at some point in the not too distant future, make an attempt to draw a line in the sand and hope for the best.